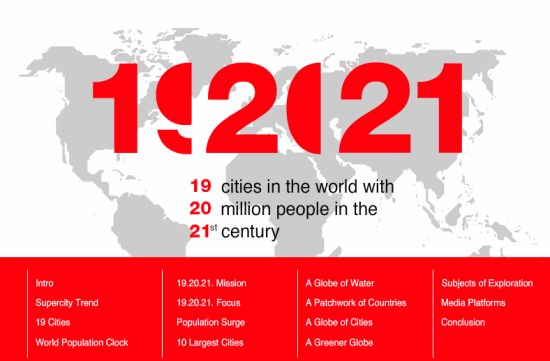 192021 is the name of an initiative (presented in a homonymous website) that aims to standardize urban information, oriented from the largely known TED site, the ESRI company and @radical.media, taking as a sample the 19 cities that will be over 20 million during the 21st century. In fact, accessing the website (or at least as of may 18, 2013) you can only see a short presentation, ambitious but without details. I imagine, according to what has been disclosed, that the five years work plan is in progress. Anyway, this example can introduce a subject which has been the object of a lot of buzz recently: the idea of Smart City. Beyond its role as tool for tech companies to extend their markets (no objection there, as anyone must make a living…), there is an interesting point in the idea: if you know more about what happens in cities, you can probably help make them work better. – Which data is relevant? Sometimes the information obtained has no clear value for decision taking, but it must be reminded that more often than not the value of a particular data item is recognized when it is available, but not before. – Who must benefit from this information? Clearly, companies can find use in that information, but when it has been obtained with public funds it must serve the citizens and their quality of live (the democracy idea is hidden somewhere…). The coexistence of a plurality of people and interests in the city makes difficult to know who can benefit from that data. Large data sets (and smart city is really on that league) are always on the verge of the hallucination with numbers. There is always the risk so well describe by Celine in the scene of the arrival to New York in the “Journey to the end of the night”… During this week I will try to show how a razor edge precision in urban data is a moving target, almost impossible to hit, but also that this does not prevent action, but rather asks for a specific approach (something I’m confident the 192021 guys have in mind).